With gas prices moving non-stop to the upside, prices are up much more than average for this time of year. 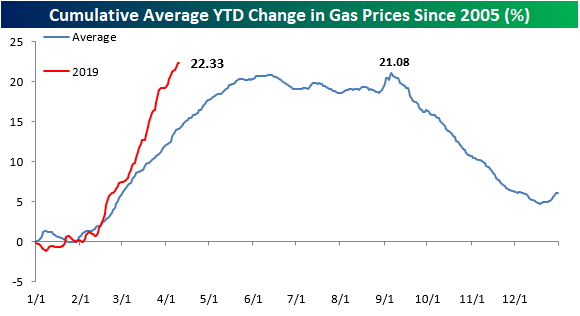 Not only have gas prices increased more than average so far this year, but also there haven't been many other years where they were up as much YTD as they are now. The one silver lining is that despite the move higher, the average national price of $2.76 per gallon is still lower than the average ($2.90) and median ($2.80) for this time of year. If you regularly fill up your car with gas, you have no doubt noticed that prices have been going up lately. 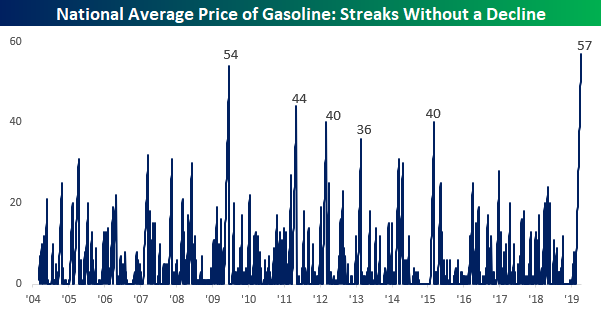 Two weeks ago, we highlighted the fact that gas prices were in the midst of one of their longest streaks without a decline. Since that post in late March, that streak of days where prices have been flat or higher has continued. At a length of 57 days, the current streak now ranks as the longest on record (since at least 2004)! With gas prices moving non-stop to the upside, prices are up much more than average for this time of year. The chart below compares the move in gas prices this year to a composite of prices in every prior year since 2004. With a gain of 22.33% already this year, prices are already higher now than they are at the average peak YTD reading since 2004. Looking at the chart, the pattern of prices so far this year has been similar to the pattern for prior years, but the magnitude of the move has been much stronger. If this pattern continues to hold, we would expect to see gas prices continue to rise right on through the end of May before leveling off for the summer and heading back lower after Labor Day. Not only have gas prices increased more than average so far this year, but also there haven't been many other years where they were up as much YTD as they are now. 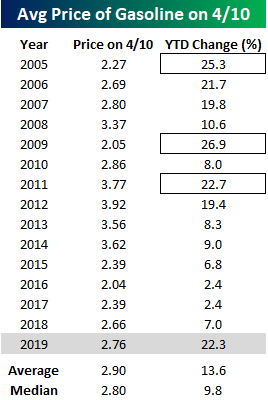 Going back to 2004, there have only been three prior years where gas prices were up more YTD as of 4/10 than they are now (2005, 2009, and 2011). The one silver lining is that despite the move higher, the average national price of $2.76 per gallon is still lower than the average ($2.90) and median ($2.80) for this time of year.